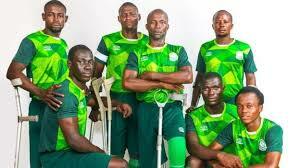 ‘Special Eagles aiming to participate in Amputee Nations Cup in Angola’ – Royal Times of Nigeria. 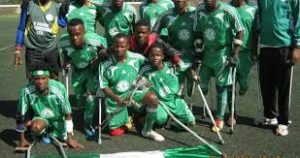 The Special Eagles intend to participate in the fifth edition of the Cup of African Nations for Amputee Football (CANAF) tournament scheduled for Angola in 2019, an official has said. Ugochukwu Obieze, an official of the Nigeria Amputee Football Federation (NAFF), said on Monday in Lagos that the sport’s World Cup in Mexico has been an eye-opener and they wanted more. CANAF is a biennial tournament organised by the Amputee Football Federation for Africa (AFFA) to determine Africa’s best team and the World Cup qualifiers. Obieze who is a member of the Special Eagles said the team’s mission of featuring in the Cup of Nations has now pushed the footballers into training to prepare early. He however said NAFF would require considerable assistance from various bodies to enable the Special Eagles attend the tournament. Amputee football is played by seven disabled players on each team, comprising six outfielders and one goalkeeper.